The Tower of Fire is constructed of stainless steel with anodized aluminum uprights. It is built to be durable and withstand the harsh outdoors elements of wind, rain, snow and sleet. It is self contained and water resistant. 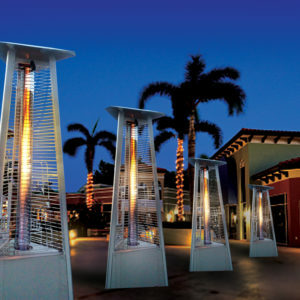 The center flame is encased in a tempered glass tube, it is shatter proof and weather resistant and withstands cold/hot expansion and even splashed water (like the pyrite tubes used in chemistry classes) It is surrounded by a protective metal screen that is safe to the touch and comes with wheels for easy transport.